Just a few of our camera collections from old to new. '1920 Houghton-Butcher Watch Pocket Carbine folding bed Camera', Houghton Ltd. built a factory in London for the production of cameras around 1905 and by 1908 the factory was the biggest camera production plant in Great Britain. '2008 Fuji Finepix S2000HD' The latest super-zoom compact features 10-mega pixel resolution and an impressive 15x optical zoom. This is known as a bridge camera because it occupies the space between compact and DSLR. I am exhibiting this Still image into our local Arts & Craft Show. You have quite a collection there. Very nice. 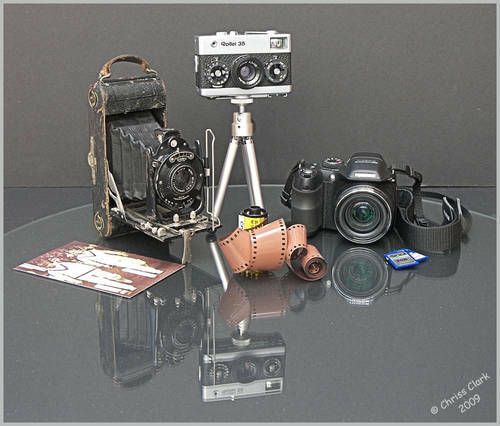 My wife collects old cameras too. Maybe I'll get her to take a picture of them to show you. My father-in-law was showing us some of his antiques and they realized one of them still had undeveloped film in it! It had sat there for almost 30 years without being developed. We were so excited to get them developed cause it was literally a look into the past. Most of them developed just fine except for the last 2, which were over exposed. He loves taking photos of trains and most of the images were taken at an old railway. Wonderful photo and really fun to view.. It sure is something how cameras have changed. I like the reflections in the table and great job setting it up. Very nice composition with lovely historical significance. I have my dad's Leica purchased in the early 50s in Germany that still works.